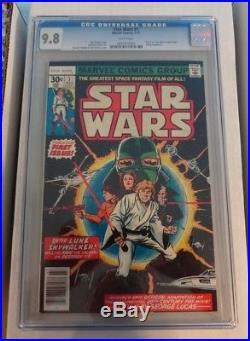 THIS LISTING IS FOR STAR WARS COMICS #1 THROUGH 107 ALL PROFESSIONALLY GRADED 9.8 BY CGC OR COUPLE BY CBCS. 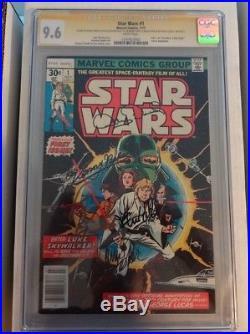 ALSO IS A COPY OF A CGC GRADED 9.6 #1 SIGNATURE SERIES SIGNED BY 5 STAR WARS GREATS: CARRIE FISHER, MARK HAMELL, ANTHONY DANIELS, PETER MAYHEW AND KENNY BAKER. 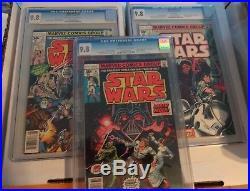 ALL ARE CGC GRADED BY CGC EXCEPT #61, 82 AND 85 ARE GRADED 9.8 BY CBCS. ALL ARE AMERICAN COMICS EXCEPT #85 IS A CANADIAN EDITION. ONCE IN A LIFETIME OPPORTUNITY. 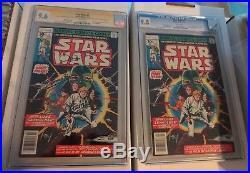 S EE ALL MY COMIC AND OTHER AUCTIONS. 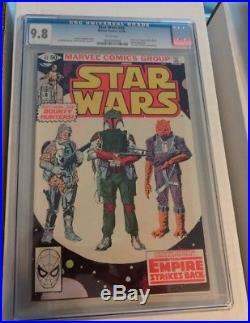 The item "HIGHEST GRADED STAR WARS COMICS COMPLETE SET ALL GRADED 9.8 #1 -107 SPECTACULAR" is in sale since Sunday, April 1, 2018. This item is in the category "Collectibles\Comics\Bronze Age (1970-83)\Superhero\Other Bronze Age Superheroes". 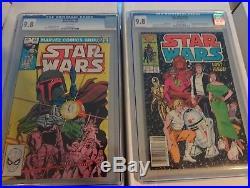 The seller is "comicblb" and is located in Salem, New Hampshire. This item can be shipped to United States.